The Watermark at East Hill hosts a special birthday event exclusively for those residents celebrating their special day during the month. 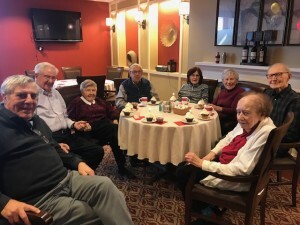 During a get-together recently, residents enjoyed delicious cupcakes prepared by our Chef. It was a wonderful opportunity to celebrate and to learn more about some of our amazing residents who are so full of life. During the birthday party, there were stories of growing up and of aging and talk about history and how times have changed. It was interesting to learn about their lives, families, careers, and even birthplaces. Some were born right here in Connecticut while others came from New York, Maryland, Pennsylvania, and even Czechoslovakia! Listening to the laughter and seeing their smiles brought such an overwhelming feeling of joy that one could not help but feel so very privileged to be a part of their lives during this time. Each day we see residents aging but unlike our own lives often enough, we understand the significance of each day, treasure the moments, and appreciate the experiences. Time is ticking, but the honor to be with each and every person from all of our communities from Independent Living, Assisted Living, Memory Care and beyond, to learn from them, and to feel connected to them is what matters most. Celebrating another birthday and all of the years that have come before means so much to all of us who are so closely intertwined with each and every resident during this special time in their lives.